Gilisoft free disk cleaner is a free disk cleaning software for Windows which removes all the junk files from your disk. This disk cleaning software has got a simple and straight forward user interface which is easy to understand. You can choose the disk to be scanned for junk files. You can also include or exclude any content from the scan. 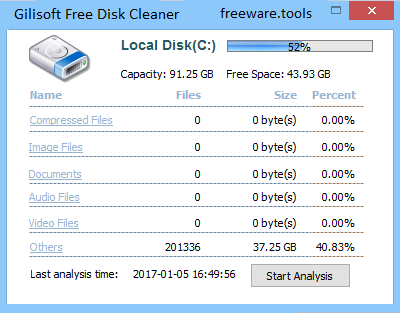 Clean All Disks Connected with PC: Disk Cleaner Free is able to clean all hard drives of your computer, flash-memories as well as USB flash drives. With a powerful scan engine, it safely and quickly finds and deletes useless or outdated flotsam and jetsam of disks connected with your PC. Gilisoft Free Disk Cleaner is a software tool that was developed in order to aid individuals in getting rid of rubbish files from their HDD or connected pen drive. The installation process is uneventful and it is over in a jiffy, while the interface you are met with can only be described as being minimal and clean. It is comprised of a few buttons and tabs, which enable a quick access to all available options. It is suitable to all types of users, including those with little or no previous experience with computers. This software utility enables you to select a partition or USB flash drive and click the “Start Analysis” button in order to launch the process. When it is complete, you can view the total number and size of compressed files, images, documents, audio tracks, videos, others and rubbish items. The second tab enables you to scan your hard drive or connected removable data device only for junk files. It comes with support for exclusion and inclusion filters, and once the operation is finalized, a list with all detected items is going to be displayed. Furthermore, it is possible to open them, or their location in Windows Explorer and view their properties, so that you can be sure you are not deleting important items. Finally, you can select items and delete them. To wrap it up, Gilisoft Free Disk Cleaner is an efficient piece of software, dedicated to both power and novice users that are interested in removing the junk files found on their hard drive, as well as analyze the contents of selected partitions. All tasks are completed swiftly, the CPU and memory usage is minimal at all times and thus, the system’s performance is not going to be hindered.